Marketings success is primarily dictated by your team and partners ability to apply their capabilities against marketing objectives. Therefore, regardless of your organizational design, developing and building a responsive, relevant marketing organization is the foundation of all successful marketing teams and needs to be a top priority. The critical challenges faced by modern marketing teams aren’t solved with an organization chart. Instead, they’re resolved by a team’s ability to dynamically apply the right mix of capabilities to the needs of the business. A team with skills and capabilities that can remain aligned with evolving business needs increases its value to the business. Conversely, marketing teams lacking key capabilities and the ability to adapt and align with more significant business objectives risk underperforming. In more extreme cases, they risk being seen as disconnected from business realities. Conduct a skills audit. The advantages of skills audits extend far beyond facilitating the organizational transformation needs of the team—it also has an impact on staff. Developing the skills base of your existing workforce helps them to improve and more easily meet their daily work and career goals. The benefits of employee training and development mean that as an employer, you’ll enjoy a far more capable, engaged and productive workforce. Collecting data on your employees’ skills base is going to facilitate smart decisions when you come to look at your recruitment solutions for upcoming digital projects. Many companies are creating brand new teams to tackle this, where others are focusing more on a flexible, blended workforce to handle the change. Which option you opt for will depend on the results of your skills audit. Develop a formal training program. Some managers might fear that employee development only helps employees find jobs elsewhere. Other leaders might worry that they don’t have the time or money to make training happen. However, well-run training opportunities help marketing leaders attract and retain talented individuals, and these programs can pay for themselves by cultivating an efficient highly-effective team. In addition to boosting employee engagement, training can enhance workplace competence, camaraderie, and sensitivity. Employees will learn both the hard skills and soft skills necessary for a smooth-running workplace. And if you design training to adjust for individual needs and roles, you can ensure each employee receives support where they need it most aligned with the appropriate model, such as Gartner’s Fat-T model for diversifying skills or a specialist model (for analytics or martech), etc. Focus on critical capabilities. Marketing leaders must ensure their team’s core capabilities support bottom-line results. 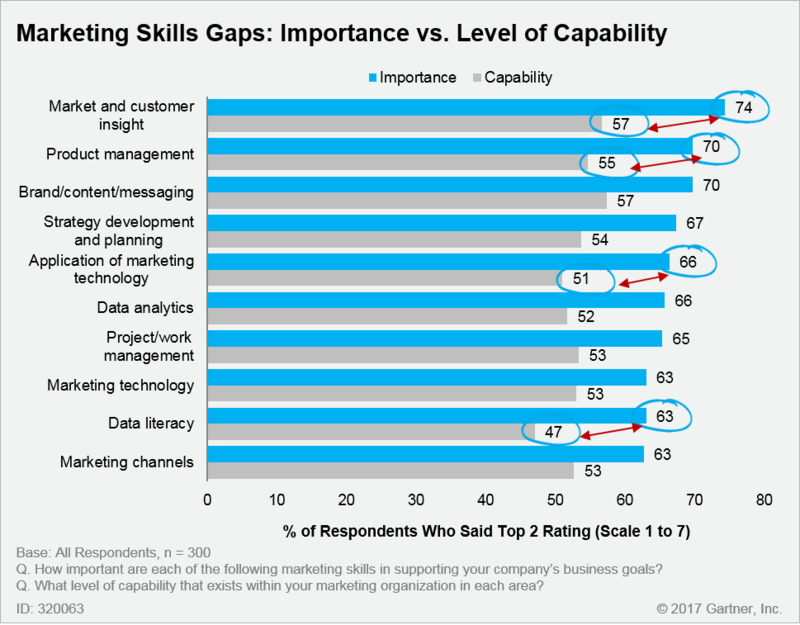 In the Gartner Marketing Organizational Capabilities Survey (subscription required), marketing leaders identified marketing insights, CX, and marketing analytics as the top skills crucial for supporting today’s business goals. Leaders must integrate capability need into their programs, advancing through Centers of Excellence or individual training efforts. Find the right partners. Depending on your business goals, your marketing organization may need help from external marketing specialists to succeed. Close to 45% of marketing leaders polled in the Gartner 2017 CMO Strategy Survey report a preference for relying on agencies and external service partners over the next two to three years to meet strategic business goals. Use structured criteria to assess your outsourcing-insourcing marketing talent mix. Explore essential capabilities and define their strategic importance and organizational fit, see “How to Balance Your Insource/Outsource Marketing Talent Mix” (subscription required). Evaluate the strategic and tactical benefits of integrating talent, including: executive free agents, managed talent marketplaces, crowdsourcing, marketing technology vendors and agency resources. How are you enabling and advancing your teams skills and capabilities?